My father is a true gardener. He knows the names of flowers in the bush and seems to have an innate ability to know when to plant things. I have always liked the idea of being a gardener; living off the land, soil drenched hands gently prodding seeds to life. But to be honest, my attention often lies elsewhere. But when a recent travelling saleswoman hinted at the not-so-healthiness of bottled herbs, she gained my attention. 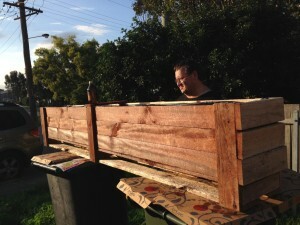 I’d seen many amazing ‘pallet’ garden beds online and my father had started to fill out his yard with bathtub gardens. Inspired, I hit him up for some assistance building something on the weekend. 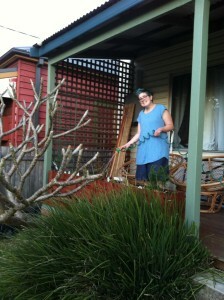 If he had any hesitation about my building skills or longevity as a gardener, he didn’t voice them. 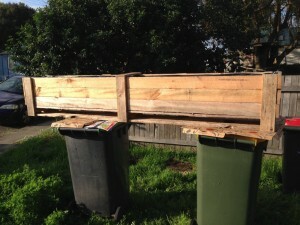 Instead he managed to source the ideal upcyclable garden base from his work neighbours. 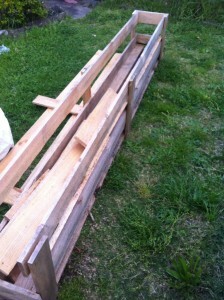 This is where your original wood will guide the process. As we started with an open pallet-like box, we decided to close in the sides and the bottom. 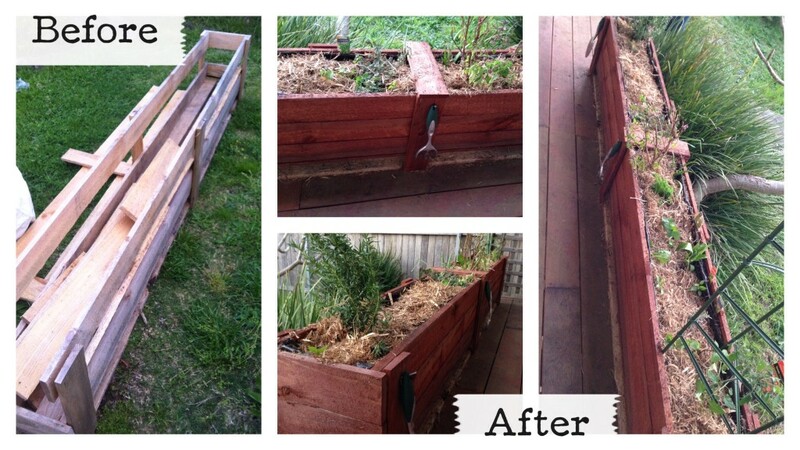 To do this, we used the extra pieces of wood we wouldn’t need (the lid) and realigned them to fill in the gaps. 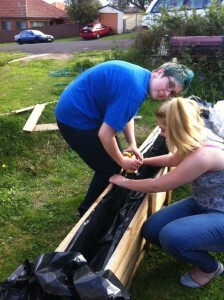 We nailed the extra wood in, sometimes securing them with reinforcement beams. 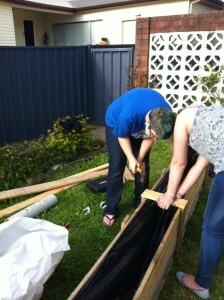 We lined our now-formed box with black garden plastic doubled over to create a soil holder. 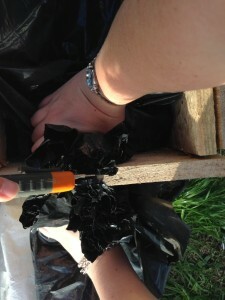 We staple gunned the top edge of the plastic to the inside of the box, allowing for significant drooping in the center. 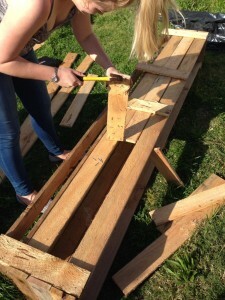 We also added a wooden brace / shelf to the top center of the bed for extra reinforcement. 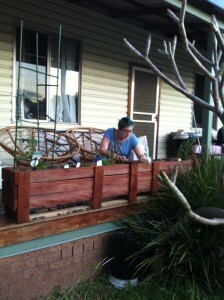 We decided to stain our garden bed to add to the aesthetics. Conveniently, the deck stain we had matched in colour to our actual deck. 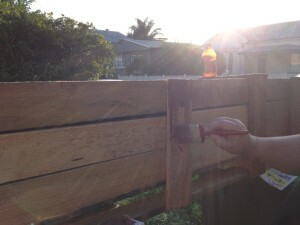 We liberally applied the stain with a paintbrush to any visible wood (excluding the bottom rung). 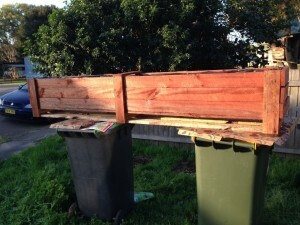 As you can see from the pictures, we placed the bed atop two bins to avoid having to bend and paint and allow quick drying airflow. 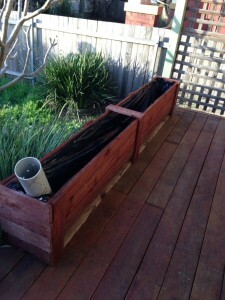 We moved the empty, stained garden bed to the desired location (on my deck). We added a layer of sugar cane mulch, a layer of soil, a layer of sugar cane mulch and a layer of soil. 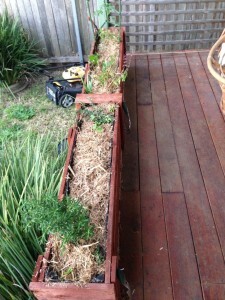 We planted our plants (both new and rehomed) and covered with a final layer of sugar cane mulch. We watered and watered to settle everything in. 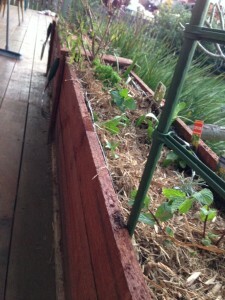 My garden bed is home to 3 kinds of basil, rosemary, thyme, coriander, parsley, curry, capsicums, tomatoes, lettuces, carrots, beetroots and chives. I’m looking forward to the first harvest!